If you are a developer, probably you would know about installation authoring softwares . 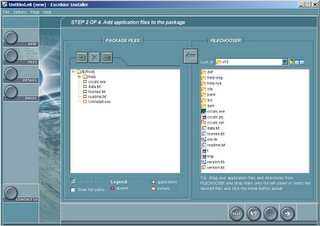 These softwares packs our installation files(.exe ,.dll ,icons and others) into a single installer so that it would be easy for the users /clients to install them directly to a computer .Installation authoring softwares also reduces the size of the installation package as it compresses the files to a single installer . Few example for installation authoring softwares are Installshield from Acresso, Installaware,NSIS, and wise installer .But all these softwares are sharewares or trailwares .Excelsior Installer 1.8 is a free installation authoring software and Installshield alternative for Windows based softwares . Many software development tools contains installation authoring software . But most of them are less user friendly and hard to learn . Excelsior Installer 1.8 has a wizard driven user interface that lets you to create installation packages in simple easy steps . Features of Excelsior Installer 1.8 free installation authoring software for Windows . Create splash screens for installation load event . Create a Windows registry entry for the application. Create Uninstaller on application root directory . Download Excelsior Installer 1.8 free installation authoring software for Windows.